My colleague Debbie Belt and I have been talking about doing a project together for some time now and we finally hit on one we are equally enthusiastic about-- Artists and their creative sensibilities. We've started visiting studios. I shoot, she writes. We post the results on a blog we call Artists at Large. Our first subject is Gale Hart, a wonderful painter and energetic spokeswoman for animal rights in the form of her art as well. I shot the second one yesterday, but I won't be revealing the name. 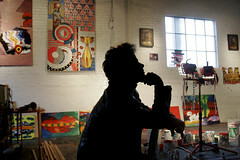 Those of you who frequent the local art world may already recognize this silhouetted artist. His identity will be revealed soon enough within the blog as it developes. In the meantime take a few moments to wander over to Artists at Large and see what we are doing! Great idea! I'll be checking this one, also. I think I'll link it from Blaqua, too! Not THE Debbie Belt? It can't be. Good to finally find another virtual place to run into each other since I now have a car and so I won't be running into her at random light rail stops any more. Awesome Charr baby! I wandered over to see what you're up to and voila! You're talkin' about what we're doin. Totally hot photo of Vanoni. Yow. Share more of Cher next time please! Feed the cat or he'll make you crazy!